At Steon Lighting we appreciate that in some instances it simply is not viable to source and install a direct replacement for an existing installation. This might be for a number of reasons; perhaps specialist luminaire enclosures and the necessity to adopt LED and lighting control technologies, or a heritage building with a distinctive styling which calls for something in keeping with the aesthetic. 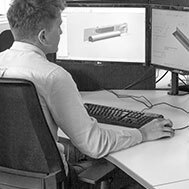 In these difficult circumstances clients can enlist the services of our design engineers. With a design brief they can conceptualise a workable solution and oversee it through production and eventual supply, ensuring that the article meets expectations and installation programme deadline without compromising on quality or performance. These retrofit and bespoke solutions can be the most cost-effective method by which to upgrade to LED and allows clients to benefit from minimal disruption, reduced installation costs and, once installed, a significantly more sustainable installation. Alstom Train Care have service pit lanes for the Virgin fleet of trains, these feature recessed linear enclosures concreted into the wall which utilised fluorescent light sources. Replacing the enclosures was neither cost effective or practical as the pitlanes are constantly in demand and prolonged closure for extensive refurbishment was not workable. Steon developed a bespoke retrofit gear tray featuring LED and intelligent controls to address the efficiency reliability of the pit lane lighting, see the full case study here. If you are involved on a lighting project which you think may benefit from bespoke retrofit solutions, please do not hesitate to contact us. In the interest of ensuring we always have a diverse and attractive range of up-to-date products, we frequently introduce new luminaires into our product portfolio. 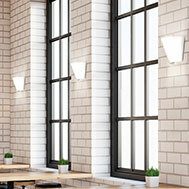 The wall range is the latest to benefit from the introduction of new LED luminaires. The new collection boasts diversity and features the distinctive attributes of both our Steon and Luxace brands. Wall luminaires can be installed to provide functional light levels, or utilised to complement and enhance aesthetics of an environment, our range includes products that lend themselves to both of these applications. For areas where the wall luminaires are the main source of light, products from within our Steon brand are suitable as they are technically advanced and offer impressive lumen packages. On the other hand, Luxace luminaires are the perfect lighting solution when decorative LED luminaires that lend themselves to appealing visuals over functionality. To browse our full range of high-performance wall luminaires, click here.